As I’ve said before, I love machinery that has a singular purpose. Too many devices try to do too much, and fall short. Spreading yourself too thin creates a weak product. That’s how you wind up with the Transformers movies. They try to appeal to absolutely everyone, and in turn, become disposable and forgettable. Instead, machines that have a single defined objective always struck a chord for me. Even if they fall short, I can appreciate the intent and effort. 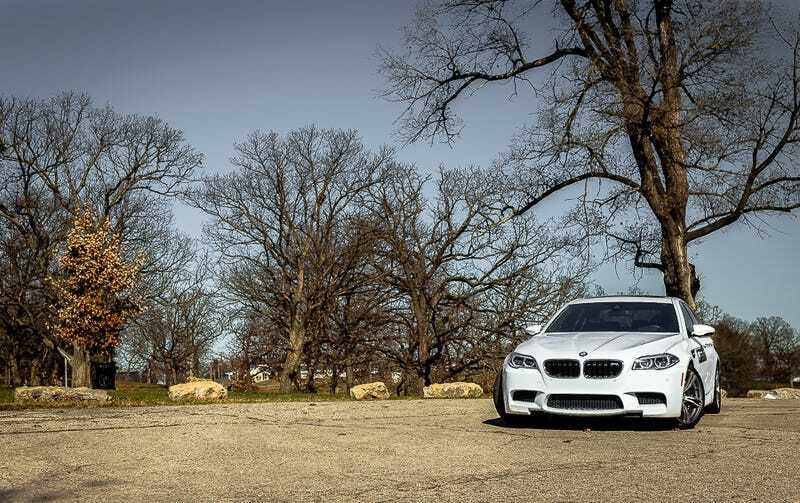 The F50 generation of the BMW M5 is one of those cars with a clarity of purpose. On first look, you could say that it is very much a conflicted design. It is a luxury car, with sporting pretension. Doesn’t that make it a diluted experience? It is not as pure of a sports car as it could be, because it tries to be comfortable. But then it is not as comfortable as it could be, because it tries to be a responsive performance machine. I offer an alternate view. In my mind, the M5 is not designed to be a Nurburgring record setter, nor a leather clad sensory deprivation chamber. Instead, it is designed to cover vast swaths of interstate at extraordinary speeds. Sure, the BMW marketing department may have different view of what the car is all about, with their “research”, and “design briefs”, and “feedback from engineering”. But I write for the internet, for free, so I think we know who is more informed. Sometimes with this gig, you have hours of uninterrupted high speed driving on empty roads. Other times, you are dealing with mileage and time restrictions. This was one of those short days. Since I have no shame, I unabashedly copied The Smoking Tire and did a brief running commentary of my experience with the car. We all know that typed words can be confusing and distressing what with all the lines, and dots, and squiggly bits. Heady stuff. So instead, watch some moving pictures and listen to my incoherent ramblings. Is there such a thing as too much power for a street car? The internet would tell you no, then probably question your sexual orientation, and then make some misspelled slur against your mother. Oh YouTube commenters, you are truly the poets of our generation. But I’m going to be contrary and say that around town, there is most definitely a limit on what I want to deal with. Wheelspin at every single touch of the throttle is certainly hilarious, but can make “stop and go” traffic a bit more interesting than I’d prefer. I know that four digit horsepower numbers and single digit quarter mile times are very impressive on the forums, but they are much less significant in the real world. In reality, it’s all about usable power. If the road surface is chilly, or damp, or uneven, or gravelled, or if the tires are just having a bad day, the M5 will lose traction at the slightest throttle input. While rolling away from a stoplight, traction control intervened with the lightest touch of the loud pedal at low RPMs. So this in and of itself means the car is pointless, obviously. I mean, I just spent the last paragraph telling you how high horsepower is irrelevant. But instead, this shows that the BMW was not designed for stoplight drag racing. If it was, there would be more tire, or different suspension, or all wheel drive. No, in a car like this, the emphasis is not on the time to go from zero to sixty. Instead, it’s all about the sixty to one-twenty. All that power might be a bit overkill in the mall’s parking lot, but when you’re dead set on crossing a county, or a country, at high rates of speed, it starts to make a bit more sense. Once you’re moving, the traction improves. The M5 isn’t all smoking tires and bellowing exhaust though. If you dial the suspension to its comfort setting, the ride is surprisingly comfortable. That sounds like obvious pandering. The comfort mode is comfortable? Ye gods! Scoop of the century! Such insightful commentary. But cars of this nature often do not ride particularly well. Zero suspension travel has somehow become equated with performance. So if it liquefies your kidneys, that must mean it’s track bred weapon. That’s not to say that you’ll be fooled into thinking you’re in an old American land yacht. There is no way of getting away from the fact that the sidewalls are fairly thin. But with enough compliance dialed into the suspension, it is surprisingly relaxing. You still certainly feel any bumps or cracks, but you’re not shattering your spine. This setting allows allows a degree of body roll. Again, not floaty, and the steering stays typical BMW heavy, but it keeps things a bit more tame. That combination of heavy steering and slightly soft suspension means the M5 tracks nice and straight on the highway, without dancing around too much over imperfections. My Cooper S for example has very firm suspension with an aggressive turn-in, so bumps mid corner can severely unsettle the car. Nothing like feeling as if the car is about to snap sideways in a cloverleaf because you hit a pothole. The M5 is much more forgiving when set in “Autobahn Mode”. Assisting the hardware is an array of software. You have all your typical passive sensors. But the piece that interests me is the heads up display. Every single time I drive a car with a HUD I am left wondering why they aren’t equipped on everything. Current speed, speed limit, and engine RPM all projected on the windshield right in your field of view. It makes using gauges seem downright archaic. The RPM is handy, because in some settings, the computers will actually let you hit the rev limiter. In a lot of paddle shifted cars, the transmission will shift at redline, regardless of if you call for a shift or not. The M5 in M mode won’t. That may seem like a downside, but not for me. If I put the transmission in “manual”, I mean it. Do not shift unless I tell you to, robot. This is how Skynet starts. First they ignore our shifting instructions, then they take over the nuclear arsenal, and the next thing you know, they’re in bed with your wife. Goddamn robots. But as handy as a digital tachometer is, the projection of your current speed versus the posted speed limit is probably more helpful on a real world basis. The M5 does not like going slowly. At all. You will become very good friends with the cruise control, because every single speed limit seems a hilarious imposition. At 55mph, it felt like I was barely idling. You’re turning barely 1500 RPM at that speed. So at highway speeds, you’re just warming it up and getting the fluids circulating. A simple software tweak will let you see somewhere in the realm of 180mph. With surround sound, heated seats, and a full leather interior. Mind boggling. While the BMW is designed from the ground up as a grand tourer, it is still capable once you get onto the tight two lane roads. The steering that was so confidence inspiring on the highway is still just as weighted and direct in the switchbacks. The twin turbocharged V8 designed for reigning in fleeing Porsches pulls you relentlessly through the long sweepers. The dual clutch transmission that responds to your every call allows to leap up and down through the gears. Treat it like a sportbike. Get hard on the brakes, and bang it down a couple gears. Partly that is good for keeping you right in the meat of the powerband, but most important, it sounds rad. I get very spoiled in my line of work. Driving cars worth more than my house has become a semi common occurrence. Which either means I drive really nice cars, or my house is a bit crap. Probably a bit of both. But the BMW M5 shook me out of my complacent stupor. The contrast between the stark interior and the ferocity of acceleration is incredibly jarring. It feels as if being confined by traffic and traffic laws is offending the car’s sensibilities and even its very nature. The power and volume that seem a bit too much in a traffic jam make perfect, beautiful sense once the road empties. Plant your right foot down, drop half a dozen gears, and feel the whole car step sideways. It lets out a Bavarian battle cry, and charges into battle. Keep up.